(Newser) – Chelsea Manning will run for the US Senate in Maryland, the AP reports. The transgender former Army soldier who was convicted of leaking classified documents filed her statement of candidacy with the Federal Election Commission on Thursday. The Washington Post reported Saturday that Manning will challenge Democrat Ben Cardin. He has served two terms and is an overwhelming favorite to win. The 30-year-old Manning listed a North Bethesda address in her FEC filing. She is running as a Democrat. Manning was convicted of leaking classified information and spent more than six years behind bars. 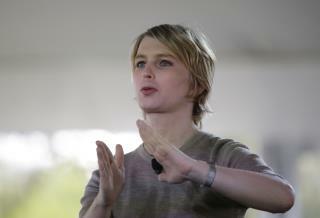 Known as Bradley Manning at the time of her 2010 arrest, Manning came out as transgender after being sentenced. President Obama granted clemency to Manning before leaving office. If he/she gets past the primary, I'll never again vote for a democrat, except a real yellow dog. Should s/he get into the Senate, wonder if s/he will take that 'oath of office' seriously.